So this post was written in bits & pieces. The process of my work so that I can justify to myself that I'm on the right track! My partner: Darci of Stitches and Scissors! She's one of my favorite bloggers and I felt like I had to get this right! "I love bright colors. Pink, Green, Blue, aqua, white, orange, yellow, grey , red etc." Her mosaic had some great colors and the comments included that she loves Owls. I also looked through her photostream for color inspiration. What colors does she use a lot? What color is her house/sewing room? A collage of MY inspiration from her photostream. 1 larger hoop for her and 2 smaller hoops for her daughters. I went with the owl theme: mama owl and 2 baby owls in nests. I also wanted to include her Flickr & blog name: Stitches & Scissors. 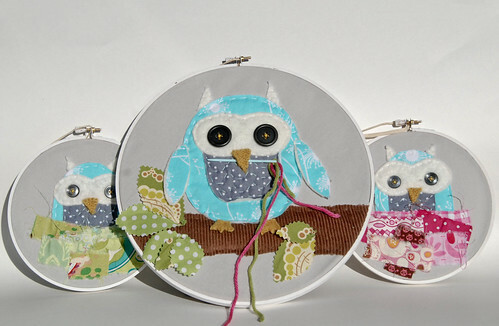 Maybe the mama owl will be holding a needle & thread? How to include scissors??? Do Gingher shears look like an "r"? Maybe gray polka dot background on all 3 for continuity? Embroidery for the words, raw edge applique for the owls & nests. Buttons for the eyes. Couched string from the needle. Bits of pink & green scrap behind mama like she just made the nests! Once I started I chose Kona ash for the background (this was before I knew her new bedroom quilt had Kona Ash! Happy coincidence). The owl was originally an orange polkadot and it was just...off. After discussing with the husband we decided to pick a new color. So I went through my scraps (these were made from ALL scraps BTW) I found the aqua. I cut an oval. The batting was just sitting on my table, so I grabbed it to give my owl a "feathery" look. Then I made the 2 baby owls and gave them nests. Done, quick and easy. Back to the mama, which was just an owl, no feet, on a grey background. I gave up on the "stitches" and "scissors" words and opted for the branch instead. Then some leaves. Then the feet. And painted to hoops white to contrast more. No process pics, sorry. But the result! They are now at their new home! I've never check the tracking on a package I shipped before, but I couldn't wait for them to get there to see what Darci thought! These are so fantastic!!! Darci is lucky! My fave part of this post is that your husband actually had an opinion. You are a lucky duck! You did an awesome job! The girls and I just love them. They look fabulous in their room. Thanks so much.